An exciting new review of TIP showcasing the reader’s opinion on the crime thriller. Hello, welcome to Book Tuesday. 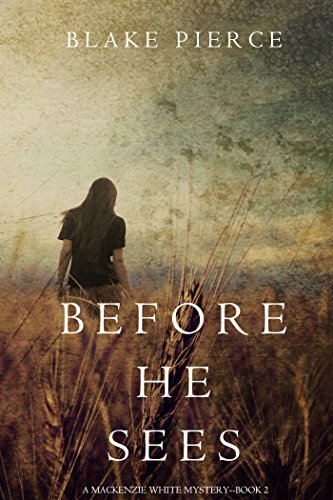 This week I have read a rather interesting crime thriller called Before He Sees (A Mackenzie White Mystery – book 2) by Blake Pierce. Mackenzie White is young police detective pulled from the backwaters of Nebraska and recruited to Quantico as an FBI rookie agent. Already a promising student, she is chosen to assist in a series of murders that have the FBI chasing their tales. The pressure to prove just how good she is mounts as another body is found and the powers that be who have given her the opportunity have set a deadline for her to solve the case or lose her job and career as an agent. Flashbacks of Mackenzie’s own troubled past mixed with previous experience from solving the Scarecrow Killer murders, which bear a similarity to the case she is helping solve, puts her in a precarious position. With no-one to turn to or share the burden of responsibility, she is pushed beyond her limits, testing her capabilities as a true detective and agent. When she is pulled off the case and returned to the status of rookie agent, her own perseverance in cracking the case pushes the powers that be to give her a second chance, but their own stubborn arrogance forces her to take drastic measures which put her in danger. This was a great thriller and I enjoyed the momentum of riding along with the main character as she pushed her way through a world of dominant characters bent on proving they are right! Though the end was predictable, I still enjoyed the thrill of the story unfolding and would recommend this book to readers who want a light crime thriller. There are two more books in the Mackenzie White series and I look forward to reading them. If you would like to read Before He Sees, click on the pic below to order your copy. As always, please leave a review for the author. It’s a great way for other readers to gauge the books. Thanks. If you would like to read one of my crime thrillers, please click on the pics below to download your copy.